Former Breitbart executive Steve Bannon is the latest casualty of White House power struggles. US President Donald Trump’s chief strategist has departed at the urging of the chief of staff, retired General John Kelly. Bannon joined the Trump presidential campaign as chief executive in August 2016, and went on to become President Trump’s “chief strategist,” a position created specifically for him, while former GOP chairman Reince Priebus was appointed chief of staff. 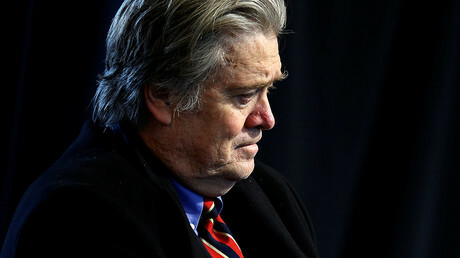 The president’s critics have called for Bannon’s removal almost from the very beginning, accusing the former Breitbart News chief executive of being a racist, white supremacist, and Islamophobe. I can tell you this, firing Bannon was never part of Trump's plan. Great work to everyone in #TheResistance! Bannon is a former US Navy officer who worked at Goldman Sachs in the 1980s and was one of the founders of Breitbart, a conservative news outlet. Earlier this week, when reporters asked Trump about Bannon and his alleged support for white nationalism, Trump called him a friend. It was the same phrasing he used about his former national security adviser, General Michael Flynn, who resigned under media pressure in February. On Wednesday, the left-leaning publication American Prospect published an interview in which Bannon talked about the US “trade war” with China and dismissed the prospects of military confrontation with North Korea. Bannon also described white nationalists as “losers” and “a fringe element” that needs to be crushed. A number of conservatives sent an a letter to Trump endorsing Bannon on Friday morning, the Washington Times reported. “While others may come and go in the White House, we feel sure that with Steve and Kellyanne at your side, you will always hear the voices of those of us who have supported you through thick and thin, despite the efforts by some to ‘manage’ you and your message,” said the letter, signed by the leaders of Tea Party Patriots, Americans for Limited Government, UrbanCure, the American Family Association, ConservativeHQ.com, and the Center for Security Policy. Bannon is the latest casualty of the purge of Trump’s senior staff that began in late July with the departure of press secretary Sean Spicer, followed by Priebus and communications director Anthony Scaramucci, who was on the job for only 11 days. Kelly, a retired Marine who previously headed the Department of Homeland Security, was appointed the new chief of staff to “restore order,” according to reporters covering the White House. Bannon’s sudden fall from power was no surprise, as he irritated many powerful figures inside and outside the Trump administration, including top military brass and banking leaders, political experts told RT. “This is the victory for the generals, it’s the victory for the Goldman Sachs people, the Koch brothers, the multi-billionaires who hated Bannon, and a lot of bad people are opening champagne over this now,” Lew Rockwell, chairman of the Ludwig von Mises Institute, said. Charles Ortel, an American political analyst and writer who considers himself to be a friend of Bannon, defended the former White House chief strategist, saying it was “outrageous” for some mainstream media to accuse him of being a white supremacist.